A recent meeting at the prestigious London School of Economics (LSE) is learnt to have reached the conclusion that India, facing general elections, is “on the brink of a dangerous crossroads”, because, it felt, Gujarat chief minister Narendra Modi, as representative of the “rightwing BJP” and allegedly “implicated” in the “massacres of Muslims in Gujarat in 2002”, has fair chances of winning.” The meeting was organised by UK’s Freedom without Fear Platform in collaboration with the LSE Gender Institute and South Asia Solidarity Group. “Showing a series of photographs of those who had been murdered, with many gaps for those of whom no photos exist, she told the meeting about these women and their lives - those who had hoped to become doctors, those full of zest for life, young girls and older women, daughters, sisters, mothers and grandmothers who had been raped, mutilated and murdered - their bodies dumped in village wells and then taken in lorry loads for mass cremations. She spoke of women whose children had been killed before their eyes”, OD said. 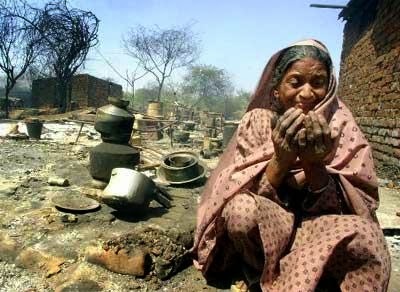 Nishrin was quoted as saying that in the Gulbarg Society in Ahmedabad, where she grew up, every Muslim house had been burnt down in the 2002 massacres and every family had lost loved ones -- deep scars of these losses remain. Nothing has been done for those whose lives were destroyed. “She spoke about her father, an enormously popular MP, an intellectual and trade unionist, who had been against the ghettoisation of Muslims and was committed to living in a mixed Hindu and Muslim area”, OD said.